If this were a question entirely about money (which it isn't), then the Knicks are the favorite. After all, they have the built in advantages in being able to offer him more money than anybody else can. But if you are Anthony, what have the Knicks done to convince you to stay? They have gone only 141-118 since making the blockbuster with the Nuggets, after Anthony had all but forced his way out of town back in 2011, with only one playoffs series win in a soft Eastern Conference. After all, they failed to make the playoffs this past season when the eighth-seeded Atlanta Hawks won a hearty 38 games. There is some hope under new team president Phil Jackson and new head coach Derek Fisher, but both are novices are their current jobs. And any hope the team has of being a title contender is a good few years away. There is no question that Anthony is an elite player, but considering he has to have a system designed around him to succeed, as well as his reputation of being a ball-stopper, simply adding Anthony to a team does not make a title contender like adding somebody like James. However, the Chicago Bulls offer Anthony such a scenario. This past year, the Bulls won 48 games despite fielding a miserable offense weakened by another season-ending injury to Derrick Rose and the trading of Luol Deng. Adding Anthony to such a system, along with a healthy Rose, would drastically upgrade such a mediocre offensive unit immediately to where they would probably become the Eastern Conference favorite. A Rose-Anthony-Noah triumvirate buoyed by a solid supporting cast and a terrific coach in Tim Thibodeau will be tough to stop. And Thibodeau is such a brilliant defensive coach that even a known subpar defender like Anthony can excel in his system. Speaking of that other Eastern Conference club, the Miami Heat now have even more flexibility in the wake of Udonis Haslem opting out of his contract, one that would have paid him $4.62 million next season. But even then, with so many moving parts surrounding the Heat as is, it still seems somewhat unlikely that Anthony will be taking his talents to South Beach. A "Big Three" comprised of Anthony-James Harden-Dwight Howard would certainly appear like a mighty one on paper. And Anthony would bring a great improvement over what the Rockets were able to throw together at the forward position a year ago. However, pairing a pair of ball-dominant types like Harden and Anthony with only one basketball to share looks like a mess waiting to happen, particularly when you also figure in Howard, and could make for a truly defensive wing pairing as well. And while Kevin McHale has done a solid job as Houston's head coach, could he be able to deal with so many offensive cooks and put them together into a championship team? There are no such concerns surrounding the Dallas Mavericks, who feature one of the top creative minds in coach Rick Carlisle. Dirk Nowitzki is aging but still a very good offensive weapon and Monta Ellis has himself a very nice season. Not to mention that the team was able to clear up some cap space by trading Jose Calderon, Samuel Dalembert and Shane Larkin for Tyson Chandler and the artist formerly known as Ray Felton. However, that cap space still may not be enough and Chandler's ability to help lure Anthony to town may be being overrated. There would not be a high profile free agent without the Lakers being involved. The bright lights of L.A. have always been alluring, and they still have a guy by the name of Kobe Bryant. But let's be honest, the Lakers are going nowhere fast and if the Lakers really are such a desirable landing spot for Anthony, he may as well go back to the Knicks. The team that may be the ultimate underdog in this situation? The Phoenix Suns, who look prepared to make who are looking to bring not just Anthony to town, but James as well. They have some cap space and can make more without having to rid themselves of their young core of Eric Bledsoe, Goran Dragic and Miles Plumlee. But it appears that their ultimate target is James while allowing James to pick the running mate of his choice, which may or may not be Anthony. And couldn't James just lure Anthony down to Miami without having to move. So Anthony will definitely have options (fully intended to be the understatement it is). But there can only be one and if you put a gun to my head, I would say that Anthony will sign with the Bulls. Even with Derrick Rose saying he will not "recruit" Anthony to the Second City, I think Chicago has the strongest offer in allowing Anthony to jump to a strong title contender right away. 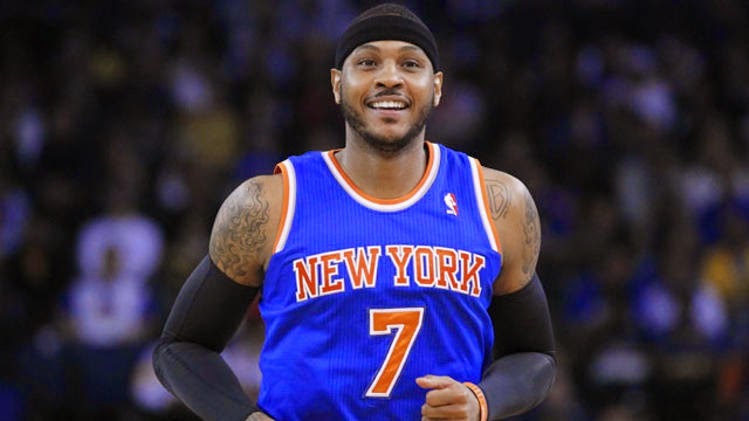 Could he re-sign with the Knicks? Sure. Could he sign with somebody else? Why not? That what makes the game so fun, now doesn't it?